In my last post, I wrote about the sentiment analysis of the Super Bowl and how brands are impacted by the real-time stream. That stream stimulates a Mean Girls phenomenon that causes people to be more passionate and start to bully as they become more popular. I know some analysts who fit this category, which interestingly was covered by Shakespeare with the character Hal in the play Henry the IV, perhaps the least read of the bard’s works. While Hal (Henry V) wasn’t a Mean Girl he’d probably act like one if he had a Twitter account. His destination as the man who would be king is in stark contrast to those who are self-proclaimed kings. There is a direct intersection these deeply insecure faux kings and the bullying phenomenon. The popularity, itself false because of the small scale on which they weigh themselves, leads to a direct lack of credibility and transparency and ultimately to irrelevance. Hal, in contrast to the unsagely analysts, always had the secret plan: act like a rogue and then show the world that he truly was truly wise and eh.. kingly. Either way, the real-time stream inherently creates corrective forces, mitigating every condescending post with an equally strong rebuttal. It is through the conversation that real themes can be uncovered. If there are strong opinions, there will be more passion. Conversely if no one cares, brands … and people slip into obscurity. It happens in football as well, a point that was implicit in my previous post, which I ended with a tie-in to this post: how the tech giants’ brands fare in the real-time world. There are some startling results. To go back, sentiment is tough to analyze. I can write “this post isn’t anti-Microsoft.” Or I can write “I love how weak Microsoft is” and it would trick most sentiment analysis systems. My intention is not to show how I hate Microsoft or love it, for I care only marginally about it. It is to uncover the trends at play using the charts and data from NetBase, which is a company that has engineered a solution to uncover true sentiment. While the analysts I refer to have no balls, the prevalent technology vendors do in the NetBase charts, to varying degrees of sentiment. NetBase’s charts show that these forces are incredibly disruptive. The chart for example shows a reality check. For example, to most, Apple is loved or liked very well and with a high degree of passion– shocking to some of you, I know. The other is that Twitter users are even more passionate about its service than they are of Apple, most likely because the real-time nature of the Twitter platform leads to more conversations about it. The other is that Facebook is near the bottom of this chart. This most likely has to do with privacy changes and issues and I would expect that ball to bounce up once the 600 million users who talk about Facebook come to terms with the frequent changes to the privacy and security model. As Facebook becomes more real-time, its ball most likely will grow in line with its 600 million users and counting. More interesting is the size of the balls of Google and Microsoft – these are two of the largest technology companies in the world, and yet the size of the ball indicates that relative to the other companies in the chart they are not part of the conversations taking place in the real-time world. Note that there are hundreds of thousands if not millions of sentiments about Microsoft and Google, but relative to the disruptive forces of Twitter and Apple, they seem to be minor players. Google, however, is well liked despite some noisy kings’ proclamations that it has failed on the social front. More likely, Google has Android and mobile is a huge disruptive force. Google’s ball will grow if the company can embrace real-time in anything else but search. Clearly the big picture indicates that change is taking place. As the world moves to real-time, the companies that operate in it or enable it are taking up the majority of conversations. Unpacking the story behind the story is Twitter. A look at the positive sentiment reveals why real-time is so important. Shared experiences, networking, engagement, the ability to bring to light false statements, creating possibilities and a sounding board are all part of the mechanics of a refined real-time system. 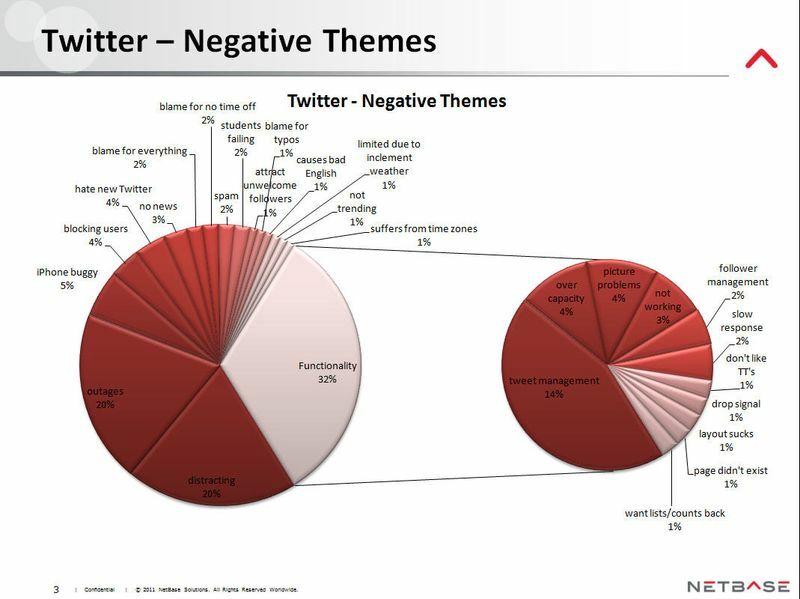 Diving deeper into Twitter’s negative sentiment reveals more positives than negatives. 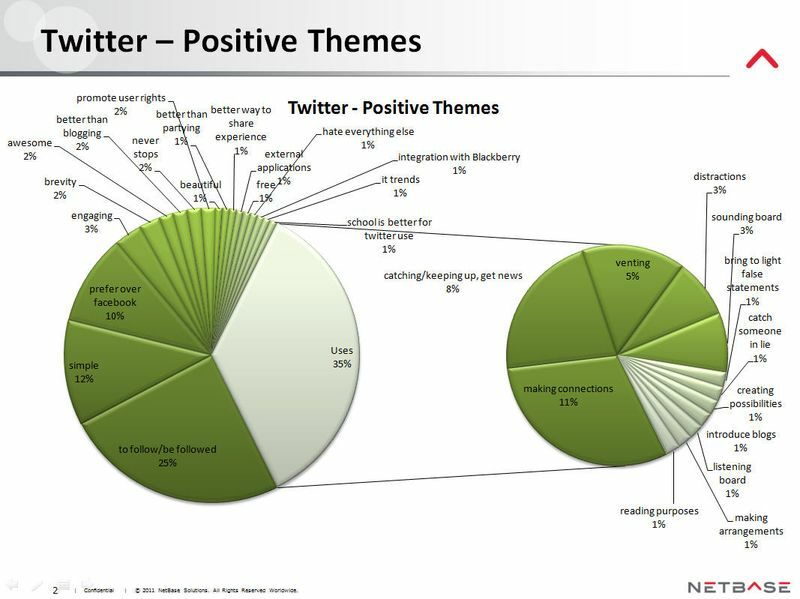 Most of the negative vibe against Twitter has to do with functionality and noise. People are using the service so much that it resulted in the Fail Whales of last year, most of which have largely disappeared. Noise, the other negative sentiment, is a good problem to have. Few people stopped driving because they got bogged down in traffic jams; instead they adjust their behaviors. Power users, meanwhile, are having difficulty with the management of the stream, gaining new followers, getting on list counts, and the platform they use to access Twitter. These are good problems to have, but they are problems nonetheless. Twitter has become the conversation, the document, and its embracing of the @mention philosophy brings even more people to the network. In contrast, Microsoft with its smaller ball invokes a completely different kind of passion, i.e., minimal. 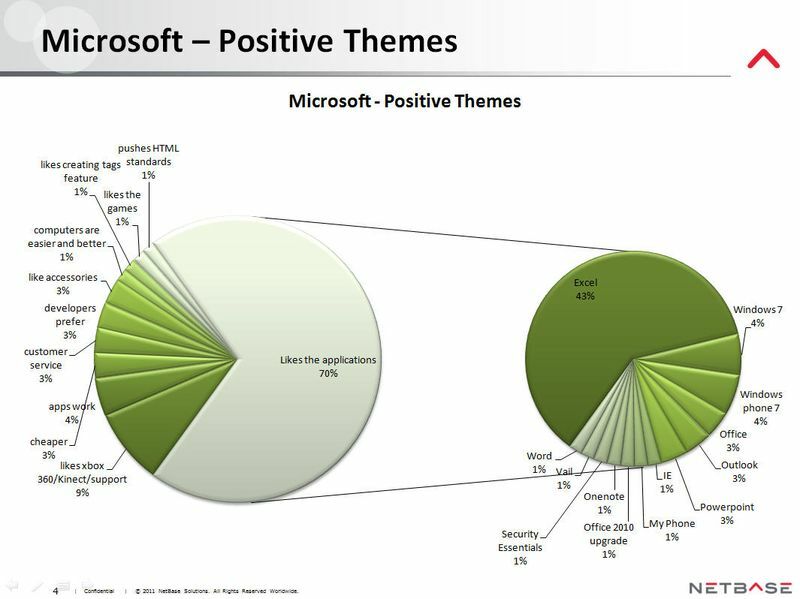 People are less passionate about it and they correspondingly talk about Microsoft less than its peers. Microsoft is liked because of the enormous installed base of its applications which are now over 20 years old and in danger of being supplanted by more modern designs around collaboration and the iPad. Interestingly, when Microsoft does get something right, like the Kinect – the passion and sentiment scores rise. 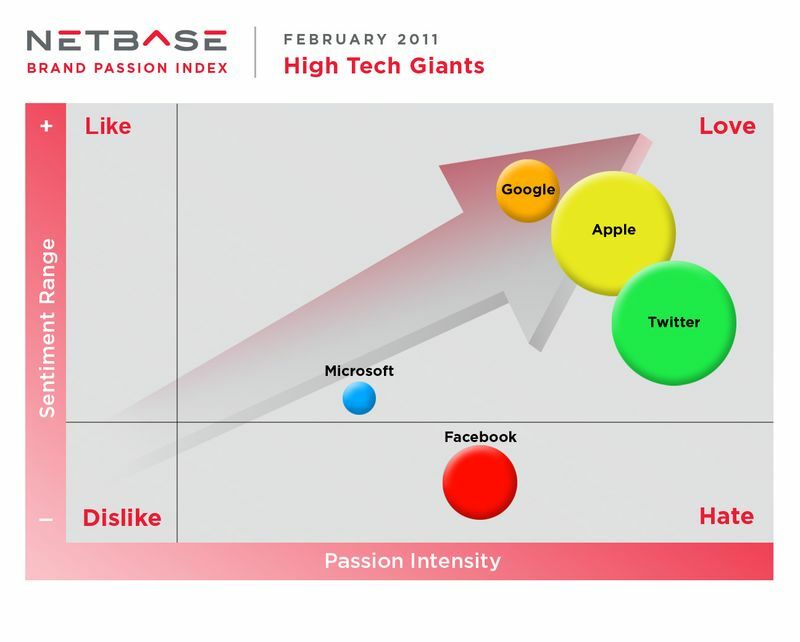 While the applications are what people like the most, they are less passionate about it. I’m a good example. I use Microsoft products, but I have no passion for them. This is in stark contrast to the early 1990s when I was in the front row of the launch of Excel for Windows and the crowd was so giddy it gave not just one but several standing ovations…for each feature. Can you imagine today jumping for joy at a new variation of the @SUM formula? Windows was the disruptive force and what it supplanted was its own operating system and the slash-based silos of applications built on top of it. 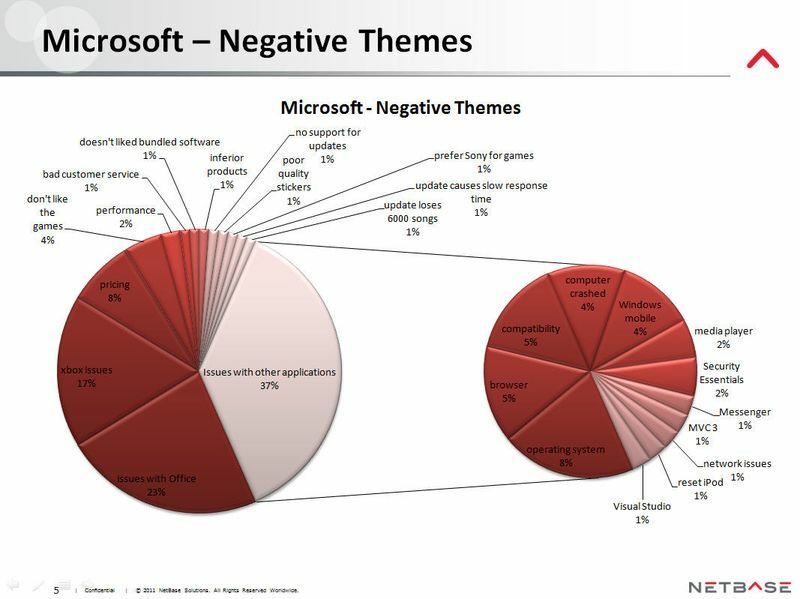 Looking at the negative sentiment of Microsoft uncovers the serious problems the company faces. Crashes, compatibility, the browser, and the platform on which third party applications are built are the major issues that trigger negative sentiment, even if the passion scores are fairly tepid behind the results. Crashes are the antithesis of real-time. So are patches, network issues, and frustrating mobile experiences (at least until Windows Phone 7 emerged). As a company like Microsoft rebuilds, removes its management team, and tries to regain its brand identity more disruption occurs. But Microsoft is also in danger of losing another part of its vast ecosystem. When it loses its platform identity and can’t incorporate the devices people gravitate to, such as the iPad and Android, it can’t execute rapidly enough to capture the impact of real-time. The passion-free nature however of Microsoft must be more troubling. Once people stop caring, it is really hard to get them to start again. Even Apple, when it went through its dark days, never had a day when its followers stopped caring. When it finally came through with a product line that changed the world – the iPod, the iPhone, and especially the iPad, droves of passionate users flocked to it. That is one facet of the future of technology brands. Love it or hate it, but be passionate about it.